Another Wednesday, another blogging tips post. So get out your notebook and get your pencil sharpened. If you’re here reading my blog, I consider you a friend. As such I want to help you succeed and I know lots of you are fellow bloggers. If you have any specific questions, feel free to ask them in the comments below or reach out to me directly via e-mail. I’ll be happy to help you out in any way I can. This week we’ll be talking about how important it is to cater to your readership rather than just assuming they are happy with what you put on your blog. When you set out writing on your blog you might’ve had a grand scheme of what you wanted to write about and what angle you would take. If you were lucky that format took off and readers loved what you were posting. More likely, you ended up straying from that original plan. There’s absolutely nothing wrong with that. A blog is often an ever-evolving medium that goes through various changes over time. Rarely is a blogging journey just a linear progression where your initial plan is followed to a T.
Usually a blogger grows as a person during the lifetime of their blog and that growth is reflected in their writing. They eventually find their true blogging voice. What they write about often shifts as they experience life changes and develop different interests. While the evolution of a blog is largely dependent on how the blogger evolves personally, they should also be considering how their readership evolves. As their blog is growing, the demographics of who is following along can drastically change. When your blog was launched, you probably had a misconception that a wide variety of strangers would stumble upon our blog right away. With that in mind you likely based your writing on hopefully pleasing the masses. In reality, your early readership often just consists of your mom and who else in your personal life is in the know about your blog. Things just aren’t as glorious as you had originally imagined. Then if you’re taking your blog seriously, you started commenting on other blogs and networking with fellow bloggers. Suddenly your readership demographics expanded from your inner circle to include other bloggers and possibly some of their readers. Too many bloggers don’t accept how blogger dominated their traffic will be for the coming months. They like to hold onto the dream of their blog taking off. By holding onto that dream, they may be missing out on the chance to get the most out of this stage of their blog. You’ve probably noticed that I cater to my blogger traffic in various ways. First of all, I do this weekly blogging tips series knowing full well that the average finance blog reader won’t care about blogging tips. I know fellow bloggers may benefit a lot from these tips though. As a result, these posts get plenty of social shares, link love and exposure outside of the finance blogging community. The other way I cater to bloggers is with my weekly link round ups, mentions and social acknowledgements. While I can I’ll be keeping up those sections as a way to accelerate growth of my blog and give back to my blogger friends. The tricky part about catering to bloggers early on is at some point, you will probably want to transition back to focusing on the original theme of your blog. As you develop more traffic, especially from search engines, less and less of that traffic will be interested in blogging related topics. When I decide it’s the right time to transition my blog focus, I will be unfortunately ending this blogging tips series. As much as I like writing this series, I know it might turn off people who are just looking to read a finance blog. The part I haven’t decided is how to keep up the recognitions and favorite posts while keeping everyone else happy. The obvious solution would be reduce the size of my favorite posts features, but that will be a tough decision. The other solution is to link out to bloggers more within regular posts, such as in a related posts list at the end of posts. I think with such a transition you should remain transparent with your readers. They should know why the format is changing so that they are not left wondering whether things will keep jumping around. So how do we know just who our readers are and what they want from us? While your traffic consists of a lot of bloggers, this is very easy. Those bloggers are likely taking part in comment conversations and making their presence known. Just via those comments, you will learn a lot about those bloggers. Send them an email or comment back on their blog and you learn even more. You should be keeping an eye on your traffic analytics and other stats. If you’re doing a good job with link building, search engine traffic should be gradually building up. To get a general break down of your traffic, compare the amount of direct traffic versus other sources. Blogger traffic will usually show up as direct traffic since they are probably opening your blog in an RSS reader. The lower percentage of your traffic that is direct traffic, the more you should be catering to a general audience. If you’re lucky, the non-blogger traffic will start commenting on your blog to help you learn more about them. On some blogs the existing community may intimidate new commenters a bit. So instead you might want to consider making use of polls and engaging readers on social media channels. By also paying attention to post comment counts and social share totals, we can also get a decent idea of which posts are doing well. Combine that with analytics data and we should be able to tell which approach is working best. The key is that we use available data and keep communicating with readers. The more we learn about our readership, the better focused we can present our content to be informative and entertaining. So how do you cater to your audience on your blog? How many of you go out of your way to keep fellow bloggers happy via your blog content? I just wanted to make it as educational as possible for my readers. Being educational is quite important in this niche. Just be sure you are being educational about topics that are suitable for your specific audience. It’s funny this post comes along when it did, because I seem to be transitioning right now in who reads my blog. Just like you said, I started off thinking the moment my wonderful words hit the internet waves that all these people would come pouring in. And so of course that’s not what happened. It was just bloggers at first, but now my traffic has switched to about half blogger and half search engine traffic. Which is cool and what I originally wanted, but it does give me something new to think about. Since search engine traffic might not care about roundups, I had thought to maybe keep roundups up for a shorter amount of time before putting up my next post. Thoughts on that? I like your blogger tips, but I could see nixing them eventually or shifting how you post them since like you said, a lot of your readers might not be bloggers anymore! P.S. That cat picture up top…are you saying that he’s supposed to be my intended readership? Becuase I don’t have a good track record of communicating well with cats. A 50/50 split is not bad, but I would be tempted to keep the link round ups going longer if possible. The longer you hold out, the more links you will build up, giving your SEO more potential. Publishing a blue collar related post shortly after the round up posts is a good idea. That way, search engines are still giving bloggers credit for the links and your other readers still get the content they want. And yes you should be catering to the cats too lol. Cats seem to understand things, but they’re just too stubborn to cooperate with what you want. So then cats are like my wife? Hahhahaha! I’m just kiddin’. Yeah, I think that’s what I’ll do. Continue with the roundups, and I like to do them anyway, but maybe have a regular post come up shortly after. Good advice, man! With blogs I think non-blogger readers will understand a bit that there is more to blogging than just writing content. So they’ll probably just overlook the other stuff as blogging crap that they can ignore. Planning and targeting a niche are something I started doing rather late for EdwardAntrobus! But that traffic is definitely blogger dominated in traffic. If You Can Read, You Can Cook is almost all search engine traffic. Unfortunately, interaction it’s very limited. So I’m not getting much feedback on what new content I should be adding. With certain niches it will be tough to really develop that interaction. With a cooking blog I’m sure a lot of people would use a recipe and then just close the blog. I’m not sure if there is much you can do about that other than work hard at building up more traffic. Turning the comments into more of a ratings system might help. I am wanting to be educational as well as offer insight to finances with my readers. Being a new blogger myself, I know that I have a bit of a learning curve, so that’s why your Wednesday posts are always helpful. 🙂 I think key is listening to your readership and using that in conjunction with what the analytics are telling you to best mold what you’re talking about on your blog. Yes analytics can be a great source of information. Not only can it tell you which pages get the most traffic, but you can also see if the people going to those pages tend to interact with your site more. If a page is getting a lot of traffic but a high bounce rate, it might not be a topic that is really going over well. Like most beginning bloggers, we thought we’d get a bunch of people wanting to read about finance articles. The thought of other bloggers coming to our site never even occurred to us. When we realized this, we set out to comment on other blogs and started our VIP Club roundup (via your suggestion!). Over the last week or two, our search engine traffic has really picked up, which we are really excited about. We love our blogger friends, but – hopefully – we’ll start seeing more and more non-blogger traffic soon! Well don’t despair over the impending end to the blogging tips series. You know you can always e-mail me with any questions. I think your blog will do awesome though. Keep things up how you’re doing it and momentum will just keep building. I can’t say that I go out of my way to keep my blogger friends happy. I guess they enjoy my monthly update on traffic and income, but I initially started that to share my growth with my readers. I simply try to educate and figure that most of the things I write about is information that people out there would enjoy and benefit from. Recently on my Newsletter giveaway I did ask my readers what they wanted to see from me. I got a few good post ideas and will be integrating them into my schedule here in the next month. Yes it is likely the fellow bloggers who would appreciate updates about stats and blog income. The average reader likely doesn’t care about that kind of stuff. So at some point you might want to consider phasing that out. It is great that some of your readers have provided post ideas. Soon I might try some polls to get a better idea of where I should be headed with this blog. Individual post topics are great, but I want to get a feel of what general approach readers will want. My blog has morphed numerous times since I started it. I think the more I have gotten to know different readers the more different topics I think of to write about and discuss. Engagement and conversation can really open up your writing, at least I have found. I honestly don’t cater per say to any specific audience but I always try to provide well researched and helpful information. That way if a topic does interest someone they are at least getting value out of reading the article. It is tough to cater to specific readers, but you can generally tell which topics go over better. It would be interesting to see how your blog has changed over the years. I’m sure it’s fairly different than what it was when you originally started. It was through a blogging tips article that I first found your blog. I’ve found those articles very useful. In my case, my blog has a pretty narrow focus (investing in fixer upper houses), yet I try to reach out to a broader audience with articles about other activities that I am involved in (book writing and self-publishing). It is a challenge when your blog focuses on such a tight niche. In that case, the readers likely do want to mostly read about that tight niche. Sometimes when you are in that situation and you stray too much it might backfire a bit. I try to keep fellow bloggers happy by writing the type of content I would want to see on a PF blog. If I can do that and keep bloggers interest I am hoping regular readers are interested as well. I try hard not to blog about blogging though. I don’t think there is anything wrong with writing about blogging early on. I know it has helped my blog a lot by getting a lot of extra links, social shares and traffic. Plus it has helped developed connections with many bloggers. You just have to realize that in the long term, it probably isn’t a suitable topic to always be writing about. I have been pondering this topic a lot lately.. how to get non-blogger readers while still keeping the ones I have. Very informative post, thank you for that. You’re right, being transparent about it is important so people understand what is happening. I think the transition phase is the toughest to manage. Bloggers will generally be understanding though. As long as you keep your content interesting and personal, most will be happy. I had originally wanted to gear myself towards young women (you couldn’t tell with my fluffy pink blog?) a lot of them are reading, but I get more thoughtful comments from male bloggers than anything else. Guess my no-nonsense attitude may be hard for the ladies to take. I would think focusing on female readers would be easy enough with all the female specific topics that guys aren’t interested in. I wouldn’t change anything with your approach other than maybe catering to the blogger traffic you probably receive these days. There are various ways you can take advantage of that traffic and make it more of a win-win for bloggers who visit. I definitely started as a way to help people with their finances, specifically their budgets. And though my community and traffic consists of many bloggers, I also have a LOT of family, friends, friends of friends, and more recently, SE traffic that is stumbling upon my blog. I have been able to help people (via Budget Fridays, Budgeting Basics, etc..) and I hope that my blog can continue to do so, but I do realize a bunch of my readers are fellow bloggers. I think bloggers appreciate your humor and very personal stories. So you probably don’t have to do anything differently to keep bloggers happy. Bloggers tend to appreciate that kind of writing over the blogs that just cover general topics with a boring approach. Keep up your interesting style and everyone will be happy. We’ve been trying to pin down exactly who we feel like we’re writing to and who our “target audience” is… still a work in progress on that one, but I feel like we’re getting closer. And defining that is going to make the transitioning process a bit clearer, I hope. That being, I do a little happy dance every time we get a non-blogger comment on a post. It’s a bit of a high knowing there are definitely non-blogger people reading, which was the goal from the beginning. I would think many bloggers don’t quite know who their target audience is. I’m honestly not sure who that will be for this blog once it evolves out of the blogger heavy traffic stages. It’s seeming to be young people who need help with finances, but I’m not sure how to narrow it down from there. And yeah it is rewarding to get comments from non-bloggers sometimes. I don’t get much of that yet, but I think the existing number of commenters may be affecting that. My blog is a combination of emotional connection, letting readers share in my firsthand accounts of what it is like to go through credit and financial hell, and educational because it provides actionable intelligence with proof and authenticity that it’s absolutely possible to accelerate the process of credit recover as well! That is understandable that you are still working on the blogger traffic side of the equation. That part is a little unnatural to people who are focused on writing on a specific topic. If you can pull it off well, your growth will be much better off. I always have a tough time deciding what I want to write about, and find interesting, and what my readership, wants me to write about, and finds interesting. I had a quick glance at one of your free for all Friday posts. It looks like you get some good interaction about what readers want you to write about. Keep up that approach and I’m sure your readers will stay happy. When I started Canadian Budget Binder it was educate and share our journey with people who wanted to learn about saving money using a budget. It has since grown to add recipes we make as well as other topics related to finance such as relationships, mortgages, investing, handy tips etc. My Facebook page and search engine traffic has and continues to be the top traffic for my blog. I don’t think I would have dreamed to have over 2000 Facebook Fans but I know that I take an interest in them each and every day. I’m not a absent FB admin and they love that. I don’t think I have as many bloggers that follow me as I’m not involved with any blogger challenges like Yakeezie. I do read many many blogs and have formed online friendships with those bloggers who also read my blog as I believe that is important. At the end of the day.. I write from my heart and I write from experience and research or I find professionals who are willing to share their expertise with my fans. The fans drive my topics and I straight up ask them what they want to learn more about but I also listen (read). If you don’t ask you won’t know. I also follow analytics as you know.. those nifty search terms help. My weekly blog post picks is rather enjoyed by my Facebook fans as they have told me it is a way to read articles which I have chosen for them that I feel is relevant to my audience. Some have told me they look forward to my Friday blog links and other blogs that they may have never heard of. So in the end it benefits everyone, the fans, the bloggers and me. If only 1 person takes away something that helps them make a difference in their life then I’m a happy bloke. My advice.. talk to the fans, engage and let them tell you their stories and build on them. Cheers Mr.CBB … Great post mate! “You can build more relationships by listening to others rather than trying to get others interested in always listening to you”. I have to say that you are one of the better bloggers at connecting with your readers and giving them what they want to read. You’ve really shown what kind of growth is possible when focusing on readers instead of fellow bloggers. Once your blogger networking builds up, you’ll be laughing. Then again, I’m sure you laugh plenty since you seem to be one of the finance bloggers with a real sense of humor. Another great post! I think my readership has evolved somewhat from just my family and friends to bloggers and people I don’t know, but all around it’s mainly a female readership which is what I always had in mind. But it is interesting to see everything evolve, and it hasn’t even been a year yet! I have so much to learn and am not sure which direction I will eventually go. I could certainly cater more toward optometrists and business topics that relate to us because on one is really doing that well in my opinion. I’m just a bit bored with that right now and trying something new. I have so many technical things to learn yet, it seems overwhelming, but I enjoy the writing part, so that counts for something right now. Rental property topics seem to get the most interest so far. Not sure how that would translate to the real world if anyone ever searches and finds me. My one funny search term was “Rednecks don’t travel, ” so maybe I need to just write a redneck blog! Thanks, as always for your tips and generosity. Sure you could focus on optometrist topics, but if that is boring you, there is no need to go there. I’m sure you’d do better by using your blog as an outlet for your other passions. If I were you I would just try to focus on working professionals who are looking to improve finances. Think in terms of who can relate most to your situation and advice. Writing more about rental property would probably help perfect the art yourself. So keep in mind those kinds of benefits. Jeremy, very informative article. I guess I’m a little slow, but I haven’t thought to try to cater to different audiences as my blog grows. As I think about it right now while writing this, I can’t see anything but benefits from this approach. Also, thanks for your blog series – it has helped me out a lot. Yep there are a lot of benefits to modifying your approach as your blog grows. In my case I also like getting a little technical and sharing some of my blogging and marketing knowledge. If that gets me on the good side of my blogging friends, that’s even better. Ultimately my blog gets more links and social shares because of it. This is so interesting and something that I should probably be considering more. My only issue is that if I pay too much attention to what my readers want versus what I want to say, my writing quality really drops off. I guess it’ll have to remain a balance for awhile until I become a more polished blogger who can whip up 800 words on any topic. Well I don’t think you necessarily have to be able to write a post on any topic your readers may be interested in. It may just be a matter of focusing more on the specific topics that seem to be doing well with your blog. If people are following your blog, they generally already like what you write about. I just try to write about what interests me or inspires me – and hope it’s of interest to others as well! That approach works fine for a lot of bloggers. 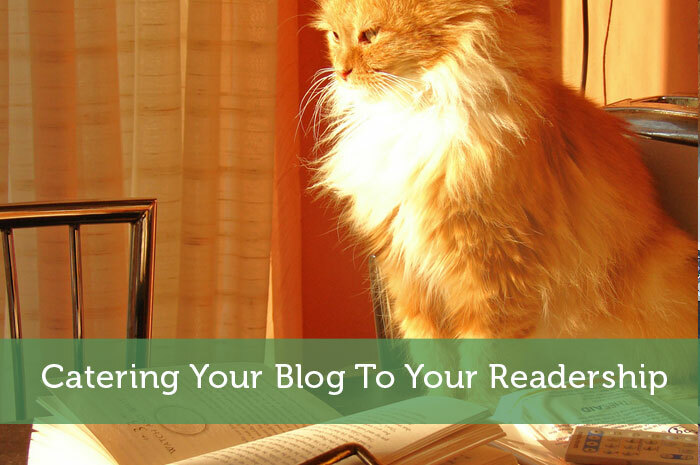 As your readership grows though, take the effort to get to know them and learn what they like about your blog and how you can keep them happy. Thanks, I needed this insight. Right now, I’m still blogging and posting articles on The Fat Dollar that interest me in the moment. The posts and articles that have taken off are often ones that I hadn’t expected to be so popular and some of the ones I was sure were “great!” just got a lukewarm reception. So having a plan, figuring out what makes an article “hit” and writing more of what interests the readers is really good advice. I also appreciate reading many of the other comments on this article … there is a lot of energy here. Love it! Good point about not knowing what posts are really going to do well. That reflects how important it is to get to know your readers. Even when you know your readers though, a post can go a bit viral and spread outside your regular group of readers. It might even be a topic that doesn’t even go over well with most of your readers. I try to write mainly from a personal experience perspective because there are many authority blogs for readers to explore for the standard topics. But I agree with you that as your blog evolves, sometimes, it is necessary to adjust your blog focus. The personal experience really is the best approach since that keeps it interesting. Plus it shows you have relevant knowledge to back up what you’re talking about. Eventually you might run out of personal stories though. Hopefully by then your blog is popular enough to switch to covering more general interest topics. To keep my readers happy I usually like to A) keep very focused on my topic with no “junk” posts and B) avoid advertising like the plague. I look at someone viewing my websites as an experience, and I don’t want them to feel like I just hope to monetize them instantly. Rather I want them to feel they have arrived exactly where they want to be (so no advertising outbound links) and use good content to encourage them to stay and become invested in what I share. In that case I guess I might not be keeping my readers happy. At this stage I’ve got other priorities than building up a strong reader base though. As other parts of my blog build up I do intend to shift to focusing more on satisfying readers though. I don’t want to bombard them with advertising, but I do intend to post more ads even if I’m more targeting search engine traffic with them. Jeremy, wonderful information as always. I am kind of following the same strategy, and really appreciate the people that take time to come to my blog (thus the mentions.) Like yourself, I realize the series on SEO will have to end, as more and more people will want to read about the money part of the blog and not so much blogging tips. Your effort to reach out to new bloggers like myself is really fantastic and hasn’t gone unnoticed 🙂 Thanks for mentions! I’m glad you’ve taken the approach of helping bloggers with tips posts too. There is so much to teach fellow bloggers. So the more people passing on their advice, the more the finance blogging community can grow. I am fairly new to expanding my horizons with commenting on other sites. I always thought that if I just write, peeps would come. Boy was I wrong. I learned more and more about being more “social” every day. Thanks for your tips. No problem Boris. Yep, you gotta get out there to get your name in front of people so that people find your content.